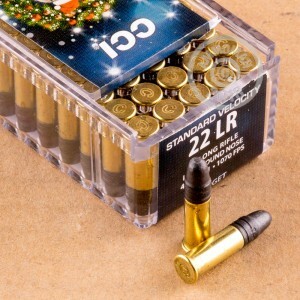 Target shooters will love finding these boxes of .22 LR ammunition from CCI under the tree or in their stockings. This ammo comes in boxes of 50 with special Christmas 2016 packaging. 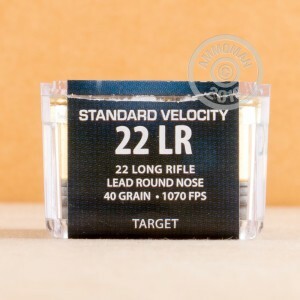 Each cartridge in this box fires a 40 grain lead round nose bullet at a muzzle velocity of 1,070 feet per second, putting in the "standard velocity" category. Since it does not cross the sound barrier, this ammo synergizes well with suppressors to produce good noise reduction. CCI ammunition is made in Lewiston, Idaho and enjoys a solid reputation as one of the most reliable brands available. Stock up at AmmoMan.com; all orders over $99 will receive Free Shipping!